Booking: Book online or phone SSW on 01464 861372. Some people can be sensitive to the some of the materials used. We provide full PPE but if you have had reactions to silica, oil-based compounds, plaster or such like, please advise us beforehand. Iron pours are outdoor therefore in severe weather conditions it may be necessary to reschedule the course dates. If you have any suggestions, questions or requirements relating to accessibility at SSW, please get in touch and we will make every effort to support you to visit. Learn how to produce sand moulds and cast with iron in this weekend course. Participants will produce a low relief plasticine pattern and use this to make their own simple mould. With the support of our Senior Technician, Eden Jolly, participants will assist on an iron pour with ‘Sputnik’, our short stack cupolette furnace, to pour their moulds and produce casts in iron. Eden will share first-hand knowledge and experience of the process from start to finish, showing participants how to clean, prepare and operate an iron furnace, prepare materials and moulds and lay out the bed. 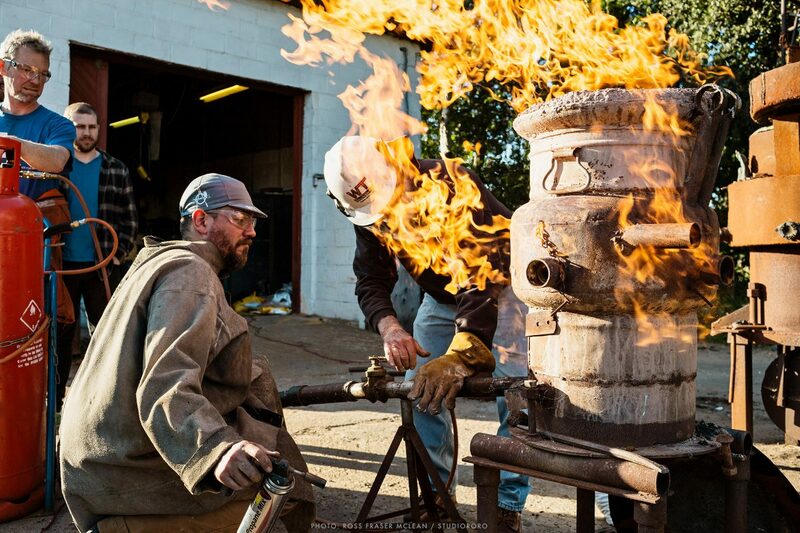 Following the iron pour, participants will gain experience in finishing, polishing and cutting; giving a complete overview of the iron casting process, and an insight into techniques used in casting with other metals.